"We’ve gathered some of the best video hands-on we can find online showing off the Galaxy S III in the flesh." Unless you've been living under a rock you probably already know that Samsung unveiled their Galaxy S3 Android phone yesterday. It was a huge event in London with a gigantic screen up front that went across the entire stage, a live orchestra playing, and a huge area behind the stage were everyone at the event could go afterwards to try out this new phone. Some hardware of the phone include the 32nm Exynos 4 Quad CPU, 4.8" 720x1280 SAMOLED (pentile) display, RGB notification LED (any color like the Galaxy Nexus! ), MicroSDHC slot, 32GB of built-in storage, 1GB of RAM. Some special features include S-Voice which is like Apple's Siri but it listens all the time instead of you doing something to invoke it on the device. It seems like it's smarter than Siri too but time will tell if it is and how useful it really is. Another interesting feature is called "Smart Stay". It will use the front facing camera to check if you're watching/reading the device and if you are it will not turn the display off. I think that's a brilliant idea. They are saying the Samsung Galaxy S3 will be available in Europe at the end of May. They didn't give a date for the US or Canada that I've seen. Compared to other devices out there one thing that's clearly different is the Exynos 4 Quad CPU. It's the only Quad-core out there in the mobile device world other than the Tegra 3. Like the Tegra 3 it is uses an ARM Cortex A9 base instead of the newer and faster ARM Cortex A15 which the Snapdragon S4 uses. However, according to some early benchmarks at AnandTech the Samsung GS 3 is no slouch. Also, while the Exynos 4 Quad is larger than the 28nm of the Snapdragon S4 it's still significantly smaller than the 40nm die size of the Tegra 3. That should give it an advantage over the Tegra 3 in battery life. It's also nice that it as a respectable 2100mAH battery. I do wonder how its LTE battery life will compare to that of the Qualcomm LTE chipsets in the S4 devices - which apparently have much improved battery life over previous devices. One other thing I should mention, there have been rumors that the US version of the Galaxy S3 will use a Snapdragon S4 instead of teh Exynos 4 Quad. 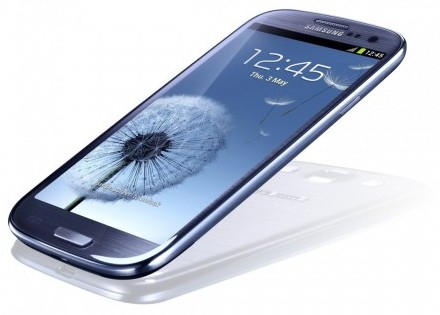 What are your favorite features of the Samsung Galaxy S3? Will this be your next Android phone? Update: The Samsung Galaxy S 3 will be available in the US in June.